Many consumers are now shifting away from personal vehicle ownership. Vehicle rental agencies and car sharing programs fill the transportation gap for drivers who don’t need a vehicle every day. Can this model also benefit the fleet manager’s operations? Perhaps your fleet already leases vehicles. What if you could achieve the same agility with your own fleet vehicles? What if you had the flexibility to assign drivers vehicles as needs change whether weekly or even daily? For a large-scale example, consider that the Government Accounting Office has recently renewed a car-sharing model in several cities. On a smaller scale, some cities are centralizing their fleet management to allow interdepartmental vehicle sharing. For example, the city of Washington, D.C. has a fleet sharing program with online reservations. Do you need to centralize your fleet? Some municipalities centralize fleet management to make fleet sharing more efficient. This makes sense if a city has vehicles in a dozen departments. For example, if public works, the parks department, the police, and the schools all maintain vehicles it’s likely that they all have equipment that isn’t fully utilized. Perhaps you can better balance your fleet vehicle options, too. If you can assign vehicles as needed, you may find that your fleet needs fewer large vehicles, which are more expensive to purchase and maintain. Centralizing the fleet isn’t the only available solution. The key is identifying vehicle requirements and communicating with fleet users. Vehicle telematics provides utilization data for those types of decisions such as which vehicle types (sedans, SUVs, etc.) are checked out the most often. 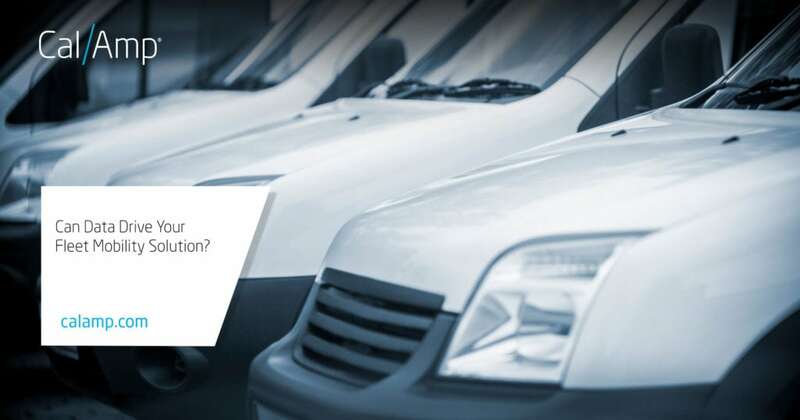 Identifying idle or little used vehicles is the first step to gaining agile fleet mobility. The internet of things (IoT) helps on two fronts: first, a telematics device collects detailed vehicle information including vehicle health, mileage, location and more. Second, applications connect device data with people through software, mobile apps and other connected devices. Fleet managers use these tools to help departments fine-tune vehicle and equipment needs. Technology provides the information fleet managers need to dispatch drivers and vehicles together. Telematics solutions make keeping track of driver and vehicle assignments easy. CalAmp’s FleetOutlook offers three ways assign drivers to vehicles quickly. Fleet managers can use the online software to update driver assignments. Even easier, drivers can use a key fob that automatically assigns the driver to the vehicle. Another option is drivers accessing the dashboard on their phones. They then can select available vehicles, receive messages, and get navigation support–all through the app. Fleet sharing and agile vehicle assignments offer clear benefits yet concerns about vehicle damages and repair expenses can cloud the picture. Accidents are going to happen to fleet vehicles. Fleet users want to know that vehicles will be available when needed and improve safety for drivers, so incidents and vehicle repairs must be well managed. Technology can help clear the skies here, too. Crash reconstruction technology, like CrashBoxx can provide reassurance that if an accident occurs, a record of incident details is captured. Managers can quickly receive crash notification, create damage reports and arrange repairs as quickly as possible. This advanced technology helps facilitate timely emergency response and captures the direction and force of impact, allowing for predictive damage assessment and accident reconstruction. Accidents happen, but technology can make managing both the incident outcome and repairs much easier. Making your fleet more mobile and flexible is all about making the most efficient use of the vehicles, equipment and other assets in your fleet. Consumers fill a transportation gap by renting vehicles or subscribing to a car sharing service. While those services are also available to a commercial fleet manager, it’s important to fully utilize your existing assets to control costs and improve safety for drivers. For more information on how a telematics solution can help your organization get the most value from your fleet vehicles, visit our page here.